I have recently joined Pintrest. 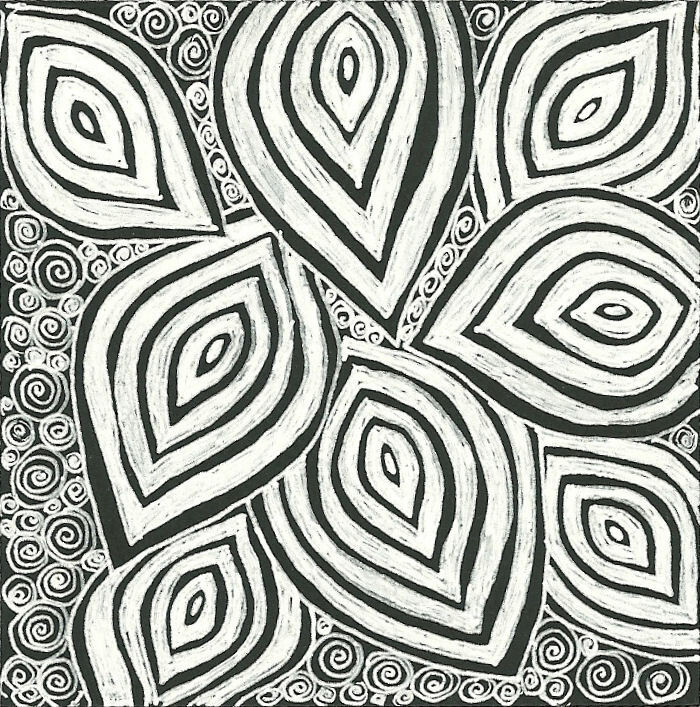 I think that there are several of you who are on Pintrest as well as I have found you and because there is a lot of zentangle art posting. I don't go on as much as I could but I have to be prepared to sit for a while when I log in. There is a lot to see. If anyone doesn't have an account and would like one, I think it is still join by invite, just hit me up via email and I'll send you an invitation. Why all the Pintrest stuff? Because it is there that I saw an incredible tattoo that inspired this tangle. Click the link to see artist information. 1. had the nerve. 2: Was sure my kids wouldn't hate me. 3. Had a better body. Lets face it, you don't get a back piece and not show it off. An anonymous commenter has noted who the artist is. I am so glad to have his name and information. He is Alexis Calvie from Black (he)art Tattoo in France. I plan on checking out more of his work and I hope you do as well. If I ever find myself in France, I think I may find him and get my first tattoo. I was really taken buy the whole thing but I was drawn to the pattern on the left in the middle. It is so mesmerizing and visual. My eye is just pulled to it automatically. I thought that it would make a great tangle pattern. So, I sat down to play with it a bit and see what I could do and this is what I came up with. I say to end with an empty space on the outside as I found that to end with black, the pattern runs together with the next one.﻿ That might be nice sometimes but I didn't care for it. I ended up choosing the name Allium as the pattern reminds me of an onion with its many layers. Allium is the Genus of the onion and I thought that sounded good. I tried it in several tangles. In this week's challenge and in the Punzel challenge. I also gave it a try on black scrapbooking paper with a white gel pen. I have a little trouble keeping this pattern small. I know how to make it smaller but I just get carried away. I hope you like it. I'm interested to see if anyone else uses it and how they do. If you use it, please post a link. I would love to see your work! That's a fab tat! I like your tangle too, it reminds me of a peacock feather. Thanks. 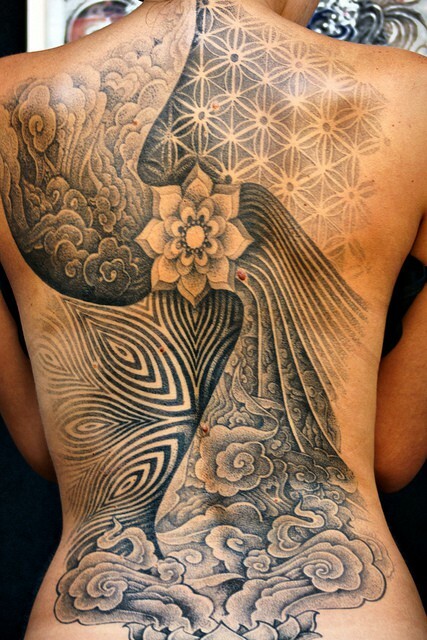 Beautiful Tangle, and awesome tattoo. Thanks for sharing. 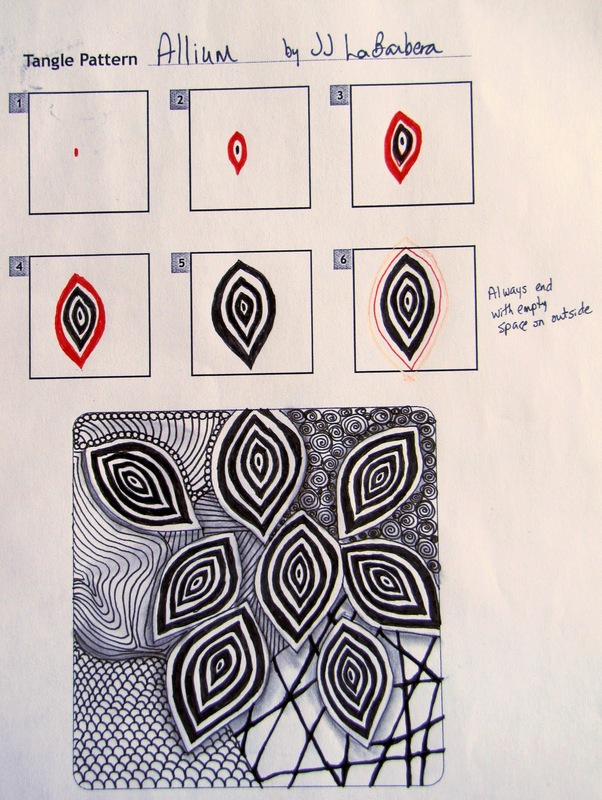 I like how you used it in your zentangles. This is fabulous.Fantastic. 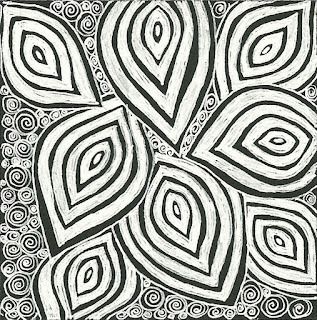 I have made my first try to made a Zentangle. But yours are so beautiful. That is an amazing tat! I love your "Allium" and have already used it a couple of times. Thanks so much. What a wonderful pattern. Found you via Linda Farmer's blog. 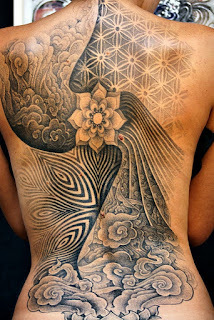 I also love the tattoo that inspired you - what a beautiful piece of art!! Thanks for sharing. Please read the Pinterest terms of service. If you pin you art work, you are giving them the right to use it any way they wish. If you pin someone else's work, you are violating copyright laws AND agreeing to pay any court cats Pinterest may be liable for. Know your risk. I am confused; are you using someone else's art work,ie.,the tatoo, and calling it a tangle? I thought a tangle had to be original to the inventor. Sorry that I am just getting to a reply to you. I wish I knew who you were so that we could discuss this more directly. Many tangle patterns are "original" to the artist but there are just as many patterns that are inspired by the world around us. For example, Florz (a Zentangle pattern) was the pattern on the floor of Rick and Maria's kitchen. I have struggled with this myself. Because of that I have posted images of those things/art that have served as an inspiration for the tangles that I have put forward. I hope this helps and answers your question. Please feel free to email if you need. So lovely this pattern. I love it right now! It's important to credit the artist... This tattoo is an original work of one my friend, Alexis Calvié, from Black (he)art Tattoo (France). This guy is awesome. You are absolutely right! I didn't know who the artist was as the flicker wasn't clear to me. I did link back to that. I will edit to include the artist information. And you are so correct, this man's work is incredible. If I ever got a tattoo, I would want him to do it. Thank you so much for the information! This one is a little bit old and he have done a loooooot of new amazing stuff since.